Black Onyx is a mineral, specifically a type of quartz that has a cryptocrystalline structure. Onyx is known for its varying color patterns, as it displays chalcedony in notable bands of color. Chalcedony is a type of cryptocrystalline structure made out of silica, and a cryptocrystalline rock is one that is textured so that its crystalline parts can only be revealed by polarized light. In other words, cryptocrystalline structures are rocks that have extremely minute, vague crystal sections that are only viewable with specialized equipment that alters the dispersal of light. Onyx and agate are cryptocrystalline minerals. Let’s take a closer look at how Onyx’s properties make it different from other minerals, even from other forms of quartz. As mentioned, onyx is a form of quartz, so it would be helpful to explore some details about quartz a little. Quartz is a mineral comprised of oxygen and silicon atoms, with its chemical formula being SiO2. Quartz can manifest itself in two different forms: normal quartz (α-quartz) and high-temperature quartz (β-quartz). Normal quartz transitions to high-temperature quartz at approximately 573 degrees Celsius. Quartz is most commonly found in sedimentary rock formations like shale and sandstone. Quartz frequently makes up metamorphic rock types like gneiss, schist, and quartzite. Quartz doesn’t weather very easily in comparison to other minerals in the Goldich dissolution series, and its durable properties mean that it is often found in residual soil or the sediment of streams, left over from the weathering of rocks around it. Quartz is around a 7 on the Mohs scale of hardness. Quartz can be found in many different colors and patterns. While pure quartz is colorless and translucent, other types of quartz have noticeable colorations that distinguish them from one another. 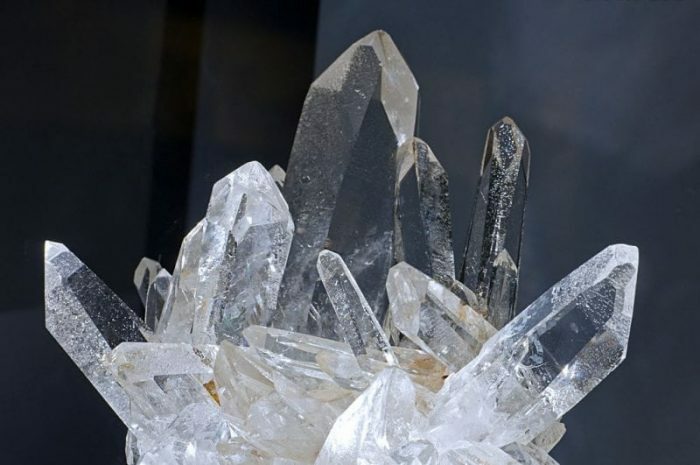 The different types of quartz are classified based off of their crystalline properties – if the quartz is of macrocrystalline, microcrystalline, or cryptocrystalline formation. Amethyst, which is typically purple in coloration and ranges from dark purple to light purple. Amethyst can be found around the world, in diverse countries like France, Russia, Mexico, and Morocco. Citrine, which is a type of quartz that is typically yellow-brown in coloration. It’s is thought that this coloration resorts from impurities in the iron compounds of the mineral. Most citrines found for sale are actually smokey quartz (see below) or amethyst that have been heat treated, as natural citrines are rare in occurrence. Rose quartz is usually a rosy red or a soft pink and coloration, which is believed to be the result of the presence of metals like manganese, titanium, and iron with the mineral. One of the largest sources of rose quartz is the Black Hills found in South Dakota. Smokey quartz is translucent, with a grayish/blackish quality. The coloration is thought to be the result of free silicon within the mineral, created by radiation breaking up silicon dioxide. While quartz can be found in single colors, it can also be found in multiple colors. These multiple colors often form as distinct bands or regions, which happens because of the cryptocrystalline properties of the material. Chalcedony most frequently appears as a brown/black or grayish blue color scheme, but it can manifest as many different colors. The vibrant colors that are often seen in commercially available pieces of quartz are usually the product of enhancement via heating or dyeing. The type of colors found within the Chalcedonic quartz and the patterns they display are used to distinguish them from one another. For example, Agate is a type of chalcedony where there is multi-colored angular/curved bands. Meanwhile, chrysoprase refers to chalcedony that appears as light green/blue bands that result from nickel oxide. Heliotrope is a type of chalcedony that is primarily green in coloration, yet with points of iron oxide that give it a red-speckled look. 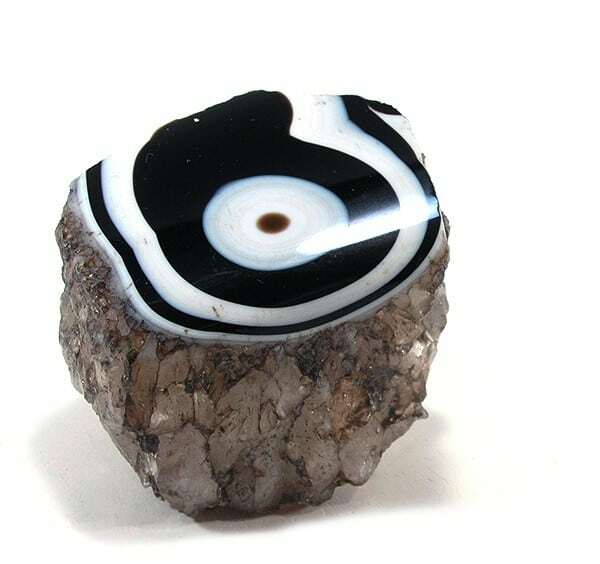 Onyx is just a type of chalcedonic quartz with white and black bands. It is technically a variant of agate ( though there is some disagreement about whether or not onyx is a form of agate or distinct from agate), and agate that has red, white, orange, or brown bands is actually referred to as sardonyx. What distinguishes onyx from agate generally is that agate usually has curved bands of coloration while onyx has parallel bands. Black onyx is cryptocrystalline in nature and it consists of interleaved sections of both moganite (a polymorph of quartz) and regular quartz. Another key difference between agate and onyx is that while agate is often multicolored, onyx is usually only black and white, though some different forms of onyx are rarely found. This arguably makes “black onyx” the default/traditional form of onyx, while variants such as red onyx are forms of sardonyx (despite this, onyx with colored bands is actually more common). Various types of artificial coloring and treatments are used to alter the coloration of onyx, leading to yellow onyx and red onyx. Even most black onyx commercially available has been treated to accentuate the bands of colors and make the stone look more striking. 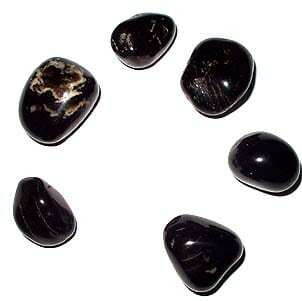 Many items sold as onyx are actually imitations made out of carbonate. Onyx can be found throughout much of the world, appearing in locations as diverse as the Argentine, Brazil, Chine, the Czech Republic, India, Madagascar, and the United Kingdom. Onyx has been used by many historical societies to make a wide variety of decorative goods. During the time of the Second Dynasty in Egypt, Onyx was used to create pottery like bowls and jars. The Minoan Crete, a civilization found on Crete between 2700 to 1600 BCE, also used onyx in their artwork as archeological finds from the region have confirmed.